There are several ways mold can establish a foothold in your home and start spreading its spores around. One of them is through the HVAC or AC system which, because of moisture buildup, can become the ideal environment for mold growth and distribution. 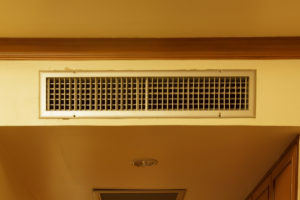 Before you have to call mold removal pros in Irvine to your aid, read on about the mold in air ducts symptoms and ways to have a mold-free HVAC system. Why does mold love HVAC systems? HVAC systems can present a breeding ground for mold because of condensation and various organic materials. Condensation is the side-effect of high levels of humidity, which are created during the heating and cooling in the system. The ducts enable the spreading of mold, so you can find yourself dealing with a black mold outbreak. Also, the dust which gathers in the ducts can contain pollen, dead cells and other organic materials, which mold thrives on. Health problems can arise from many sources, but symptoms such as coughing, wheezing, sneezing, allergies or asthma during the HVAC season can mean mold is present. Other symptoms are visual and olfactory. Obviously, if you see mold or mold-like substances around the ventilation ducts, it’s time to call the pros so they can apply mold remediation strategies. Another sure sign of mold is the intensive odour, especially present during system use. You should work on preventing mold before it even appears, not just because it means investing less money, but because of the potential health hazards it poses. These are the aspects you need to consider. When choosing a HVAC system, make sure it’s the right size for your household. Its efficiency depends on it and so does its ability to dehumidify properly. If there isn’t enough time for dehumidifying because the HVAC size makes it turn on and off more often, there is a danger of mold growth. This applies to both oversized and undersized systems. Cleaning the system regularly can prevent the appearance of the mold in air ducts symptoms. This includes cleaning and replacing the filters on a timely basis, checking for leaks and getting rid of excess water and moisture. When the weather is humid, keeping windows and doors closed can help keep the humidity outside. This prevents its buildup indoors and enables more efficient functioning of your home system. Although you might be tempted to keep the fan running all the time for better air circulation, this might actually contribute to a higher level of humidity. This is why it’s best to turn it off every once in a while. Found mold in air ducts symptoms? Let EHS take over! Seeing mold in your HVAC system isn’t the end of the world. When you do notice mold in air ducts symptoms, all you have to do is call EHS for a swift and efficient intervention. We know exactly how to get rid of this pesky problem before you even know it! Using state of the art equipment, our technicians will look in every nook and cranny, making sure your HVAC system is completely mold-free. Allow yourself to stop worrying and relax, because after you’ve called EHS it will be taken care of in style!